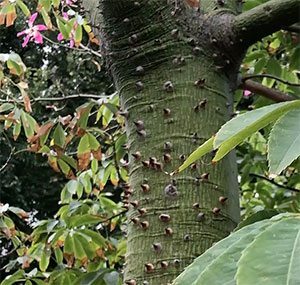 A fascinating tree from central America, Ceiba pentandra is commonly called the Kapok tree. It is also regarded as a sacred tree in Mayan culture as is considered to connect with the underworld or different dimensions. The young trees have trunks covered with spines or large rounded thorns, and these appear in Mayan art and ceramics. As the tree ages the thorns disappear or at least become fewer and less prominent. The leaves are palmate and a mid green. The tree can be deciduous, shedding leaves in dry periods. The flowers are pink and white, appearing in late summer. After flowering, seed pods appear and these are filled with what we call Kapok, a water resistant fluffy cotton like material once used to fill mattresses and cushions. This is an easy care tree that requires a well drained soil and sunny position. It is drought tolerant and reasonably fast growing. 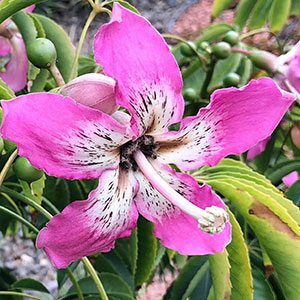 Usually regarded as to large for most gardens it is used as an ornamental tree or shade tree in parks and is common in botanical collections. Propagation is easy from seed. Growth rate – Medium in cultivation. Flowers – Large pink and white with an unpleasant odour. Flowering season – Late summer, however varies with climate and moisture. Foliage – Mid green, palmate.